Sonja Morgan likes to spin yarns, but she went too far when she claimed to have partied with John F. Kennedy Jr. Fortunately, Carole Radziwill was perfectly happy to call Sonja out during the RHONY reunion. Remember way back near the beginning of RHONY Season 7 when Sonja Morgan claimed that she used to party with John F. Kennedy Jr.? Nobody believed her at the time, but there was enough other drama going on that most people didn’t bother to question her too much. That all changed during tonight’s reunion, when the gals discussed Sonja’s earlier JFK Jr. name-dropping at length. Did Sonja actually hang out with JFK Jr.? Or did she make up the entire story in order to impress others? After Andy Cohen brought up the old “John-John” issue, Carole — who actually knew John F. Kennedy Jr. — made a good point: None of JFK Jr.’s real friends referred to him as “John-John.” This was merely a moniker used as a slight against a guy who, according to the tabloids, was nothing more than a huge party animal. Sonja may have read plenty of tabloid stories about JFK Jr., but that doesn’t mean that she was his best bud. Sonja hasn’t received a ton of Twitter support these past few weeks, in part because she body-shamed a gorgeous model who allegedly lacked a defined waist. Tonight, the reality star attracted even more criticism than usual, with most RHONY fans agreeing that her story about “John-John” was dubious, at best. Pretty much everybody agrees that Sonja is making things up or, at a minimum, exaggerating her relationship with “John-John.” But what fans of RHONY can’t figure out is why she’s so intent on talking about the guy like he was her friend and her friend only. In doing so, she’s distorting his legacy, disrespecting his memory and hurting those he left behind. It would have been nice to see Sonja actually own up to her mistake and apologize, but instead, she merely dug a deeper hole for herself. Contrition simply isn’t Sonja’s style, which is too bad — she could have repaired a lot of the damage by simply owning up to her tendency to exaggerate. 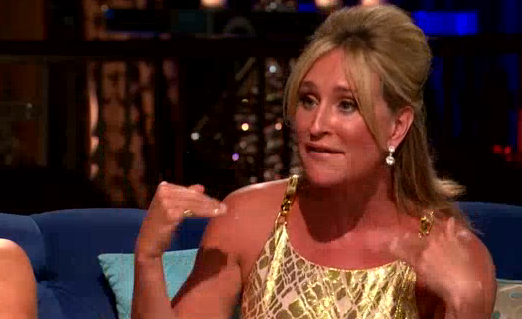 Do you believe Sonja Morgan’s story about John F. Kennedy Jr.? Comment and share your thoughts below!